King's Candy: A New Orleans Kitchen Vision One of the most clandestine kitchens ever was created by an inmate in solitary confinement in Louisiana's Angola State Pentitentiary. 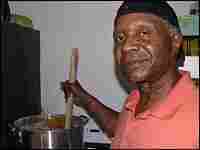 Over three decades, Robert "King" Wilkerson perfected a recipe for pralines, which he made in a makeshift kitchen in his tiny cell. Label reads: "In 1962, I learned to make candy from a fellow prisoner named 'Cap Pistol.' Over the years, using a stove made from cans and tissue, I perfected the recipe. Now that I'm free, I can make life a little 'sweeter' for you!" Before he went to prison, Wilkerson wanted to open a restaurant or be in a band. He was known in the Algiers neighborhood of New Orleans for his singing and his cooking. Sam Cooke was — and still is — his inspiration, for a lot of reasons. In a huge pot put all ingredients except pecans. Heat on a high fire, stirring continually so the mixture doesn't boil over. Stir until the mixture is a caramel. Pour onto large greased sheet pan, then add pecans. Allow to cool a bit, until you can handle it. Using a spoon, whip the mixture. "Talk to it, show love to it," says Wilkerson. Either leave completed mixture in sheet pan to cool entirely, or before it's fully whipped, use a spoon to remove the mixture into smaller rounds, placing them on a second sheet covered in wax paper. Wilkerson warns that "candy has a mind of its own" and varying temperature and humidity can effect the result. Makes 25 3 1/2-ounce pieces. Some 2,879 minutes of listener messages have filled the NPR Hidden Kitchen Hotline with tips about food preparation in unexpected places. The Kitchen Sisters sift through each of them in amazement -- stories of "hippie kitchens" spread out in the parking lots at Phish and Grateful Dead concerts, of a secret "toolbox kitchen" selling hidden brats and buns on an auto assembly line in Michigan, of meals under the big tent of a traveling family circus. "There are some very, very talented people in Angola," Wilkerson says. During his three decades behind bars, he heard songs and singers that could break your heart. It prompted The Kitchen Sisters to listen to the haunting and powerful collection of music recorded at Angola in 1959 by folklorist Dr. Harry Oster. They also turned to recordings made at Angola by famed folk music archivist Alan Lomax. These weird, beautiful, political and eccentric messages fill some 36 CDs, and when either of us needs a boost when the news gets too bad or the world seems too divided and at war with itself, we pop one in as we drive and listen to these tales that somehow seem to capture the soul of America, through food. "My name is Orissa Arend. I have a friend, his name is Robert 'King' Wilkerson, who created the most amazing kitchen. 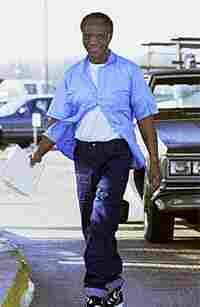 He was in prison at Angola State Penitentiary in Louisiana for 31 years. Twenty-nine of those years he was in solitary confinement, basically as a political prisoner, because he was a Black Panther. He started a chapter of the Black Panther movement with two of his other friends. 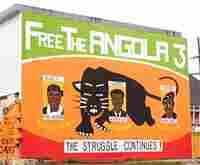 They had become a sort of a cause celebre known as the Angola Three. Somehow, in solitary confinement, he managed to create a kitchen -- and he did it out of a stove made of coke cans, and he burnt toilet paper rolls to get heat. And he made pralines, which we love in New Orleans. He made these delicious candies and perfected the recipe, hidden in prison. They decided they had made a mistake for locking him up for so long. 'King' had a new trial, and he's out now, and he sells his candies which he calls "Freelines." He does it as a way to help raise (consciousness) about political prisoners. 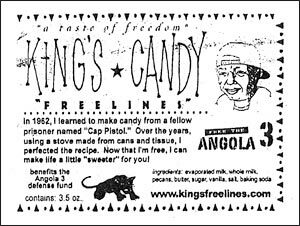 'King' learned to do it from his friend 'Cap Pistol,' who was in the kitchen at the time and taught him how to make sugar candy. And they are really, really good." After Hurricane Katrina decimated the Gulf Coast and led to the flooding of New Orleans, e-mails began to appear, listing the missing. Wilkerson's name was among them. Arend had evacuated to Natchez, Miss., and we finally found her on her first day back in New Orleans. She told us "King" weathered the hurricane in his apartment, and some two weeks later friends from Austin, Texas, reached him and his dog by boat. We wound up finding the network of political activists that work for prisoner's rights and the Angola Three -- and who helped get "King" some of the choicest Texas pecans for his pralines. Wilkerson's friends say he didn't leave New Orleans because he was waiting for a batch of freelines to harden -- that's how much he cares about making candy. But we think that after 30 years in confinement, he just couldn't imagine being confined again, even in the Superdome. And he couldn't leave his dog. It turns out that before Hurricane Katrina hit, Wilkerson had planned to travel to the San Francisco Bay Area to work with his friend, Rigo 23. The young Portuguese artist had been commissioned by San Jose State University to make commemorative statues of the 1968 Olympic track stars John Carlos and Tommy Lewis, who had raised their gloved fists on the podium in Mexico City in a salute to black solidarity and power. Rigo had made a "Truth Mural" in honor of Robert "King" Wilkerson in San Francisco after King was released from prison in 2001, and the two became close friends. They often travel together, speaking out against injustice and for the rights of political prisoners -- and also to keep attention on the other two members of the Angola Three. Herman Wallace and Albert Woodfox have both been held at Louisiana State Penitentiary, aka Angola State Prison, for some 30 years. 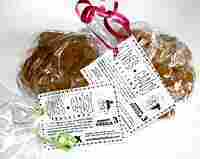 Wilkerson had made pralines two days before Hurricane Katrina hit, and gave all the candy away to the rescue workers helping trapped city residents evacuate in boats. When we met him, he just did not have the heart to make candy. But a few days before he left the Bay Area to return home to New Orleans, he made us a big batch of beautiful "freelines."